Missouri Education Watchdog: Common Core Proponent Thinks Changing the Name of the Standards will Cease Dissent? Common Core Proponent Thinks Changing the Name of the Standards will Cease Dissent? Arizona’s superintendent of public instruction wants to take the politics out of the Arizona Common Core Standards without loosening any requirements of the state’s tough new academic program. On Tuesday, John Huppenthal said the term “Common Core” has become so politically charged it has become nearly impossible to explain the state’s new academic standards to parents and voters. So, he will ask the State Board of Education to approve a name change, replacing Common Core with “Arizona College and Career Ready Standards.” He also wants the state to withdraw from a national coalition that developed the standards but has since become a political lightning rod for conservatives. Huppenthal emphasized that nothing would change in Arizona classrooms. Teachers will stick with the new Common Core lessons rolled out at the start of this school year, and students will still take an annual assessment to measure what they have learned, he said. Michelle Udall, a Common Core supporter and Mesa Public Schools governing board member, said that she frequently encounters Common Core opponents and contends that the “vast majority” of critics are misinformed. She said she was not sure whether a name change would resolve the issue. Huppenthal and his staff say the need to make the change goes beyond politics. They say it has become “nearly impossible” to talk about academics and the needs of schoolchildren without anti-Common Core sentiment muddying issues. So the answer to anti-Common Core sentiment is to change the name but keep the standards. By renaming them it takes away the "political nature" of Common Core. Udall hints that this borders on the absurd and she is correct. Changing the packaging but keeping the same product does nothing to change the fact the standards are not based on best educational practices, field tested, nor have the proponents offered any research/data to back up their claims on their excellence. It has less to do with politically charged rhetoric as it does with standards and assessments being pushed through without legislative approval/vote and no research/data to prove their effectiveness. I would suggest the "anti-Common Core sentiment" won't disappear with a mere name change as the facts of the adoption and implementation remain the same. 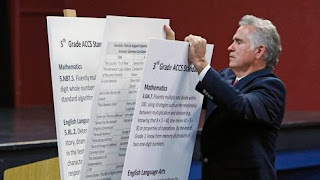 So many opponents mistakenly believe that Common Core will give the government license to collect personal data about students’ families that Huppenthal’s staff members have started carrying fact sheets that allow them to accurately respond. Wesley Harris of Moon Valley, on Monday filed a petition with the Arizona Secretary of State’s Office to create a political-action committee called We the People AZ Against the Common Core. He said the group has the same members as one that is working to repeal Medicaid expansion in Arizona. Its goal is to get financial support for a ballot initiative to repeal the Common Core. Harris said he has read the standards and believes they will reduce the quality of public education in Arizona. It would be interesting to see what exactly these CCSS proponents' fact sheets contain and the research and data behind their facts. I just can't figure out how changing the name will make those who understand what common core is, what it costs, how it circumvented the legislature and the data retrieval will pacify the taxpayers who have concerns about these issues. John Huppenthal said the term “Common Core” has become so politically charged it has become nearly impossible to explain the state’s new academic standards to parents and voters. Does he really think that repackaging the standards with a different name make them more palatable or legal? Of course they are going to change the name. Then people that don't have time to research will not realize that it's still common core and they won't argue about it. Just like they changed the name to the morning after pill. It used to be abortion, but now they call the morning after pill "contraception". That way abortion can be covered by Obamacare without argument. A Core by any other name is still a Core. Come on John, you can do better than this...what's keeping you from what is doing what is best for Arizona? A Core by any other name is still a Core. Come on John, you can do better than this for Arizona. Luckily, Arizona has a consistent constitutional conservative challenger to John Huppenthal. With a stellar record as a school governing board member and president for the third largest school district in Arizona, Diane Douglas has taken the plunge and is waging a strong campaign. Douglas has debated her opponent once and now he will not accept any invitations where she is on the same agenda. Thanks for exposing the tricks of the Obama-Duncan administration. Huppenthal is bought and paid for by the Obama-Duncan PARCC Cabal. Worse, he has formed an alliance with our governor - who has pushed through an Obamacare expansion here in Arizona. Brewer issued an Executive Order (remind anyone of the actions of BHO?) at Hupp's request since they knew that the legislature would never approve the deception. It is fortunate that Diane Douglas, former Board Member and President of the third largest school district in Arizona, has stepped up and is challenging the incumbent on every front. A consistent, constitutional conservative, she debated Huppenthal in Casa Grande last month and now he will not accept invitations to speak if she is going to appear on the same program. Douglas needs some contributions to get her message out since he is being supported by the education and business establishment including Intel, the AZ Education Assn. and the AZ Chamber. Her website is www.dianedouglas.com and she can be contacted directly at: electdianedouglas@gmail.com. Thanks for your work in getting the word out on the evils of Common Core.